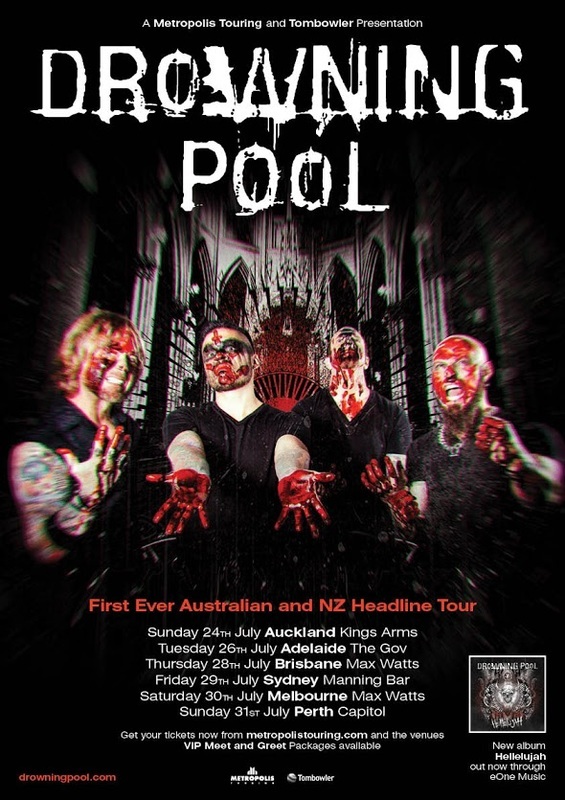 ​Texan powerhouse quartet Drowning Pool are set to return down under this July. After a fourteen-year absence, the band have set their sights on Australian soil for their first ever headline tour plus a special one off New Zealand show. Big sonic slabs of muscular power with a taste of the dark melodies of post-grunge remain Drowning Pool’s stock and trade. Their music is an unapologetic celebration of life’s joy and pain, able to swiftly maneuver between defiant declarations of resistance. Each distinctive era of the band’s history is represented onstage, where the band bashes through an arsenal of anthems all delivered with precision strength. Drowning Pool burst onto the hard rock scene 15 years ago with their platinum selling debut album Sinner and continue to be relevant. The band are heading to Australia to support their critically acclaimed new material Hellelujah which is the album their diehard fans demanded and the aggressive heavy rock world at large deserved. Reenergized with the addition of fierce front man Jasen Moreno, proudly amongst the soul of Drowning Pool original members CJ Pierce, Stevie Benton and Mike Luce, this is a rebranded monster ready with teeth bared heading straight for the jugular! Australian / NZ fans have waited impatiently since their Big Day Out appearance in 2002 to witness crowd favorites such as Sinner, Step Up, Tear Away, Pity and floor filler smash hit Bodies. this July fans will be treated to a hard hitting headline run. The Lone Star State conquerors deliver a heavy batch of hell raising anthems, each burning with fiery adrenaline destined to ignite crowds into impassioned sing-alongs. Limited numbers of VIP Meet and Greet packages will be available but they will not be around for long!